It’s become an annual tradition. CMJ and Bridges and Powerlines. This year, Bridges and Powerlines will play an Official CMJ Showcase at Pete’s Candy Store on October 22nd as part of CMJ’s Music Marathon and Film Festival which takes over New York from October 19th through October 23rd. This year’s festival features hundreds of musical acts including: Phoenix, Surfer Blood, Two Door Cinema Club, School of Seven Bells, Justin Townes Earle, Black Label Society, Four Tet, The Drums, and many more. This stop at CMJ is part of Bridges and Powerlines fall tour with dates in New York, Philadelphia, and North Carolina. The tour will preface the release of their second full-length album, Eve, which comes out January 18, 2011. The album examines life before September 11, 2001, a significant date to most Americans, but especially for the members of Bridges and Powerlines. Andrew Wood (keys/vocals), David Boyd (guitar/vocals), Keith Sigel (bass/vocals), and Mason Ingram, of Connecticut, Kentucky, North Carolina and Texas respectively, they were all drawn to the city out of the nostalgic goodwill that developed as the nation recovered. The city they soon called home was beginning a indie pop boom, and the four of them, with their shared love of intricately arranged three-minute pop songs became a part of it. 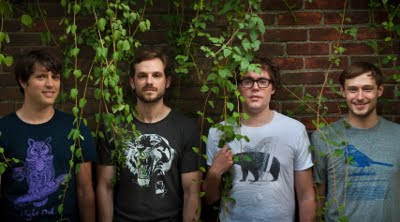 Bridges and Powerlines has received much praise from the likes of Pitchfork, “now that's power,” Paste, and The Washington Post and their first album Ghost Types, which was produced by Chris Zane (Les Savy Fav, White Rabbits, Asobi Seksu), enjoyed a seven-week run in the CMJ Top 200. Gothamist said they are “worth standing in a crowded club to see,” which audiences all over the east coast may just have to do.